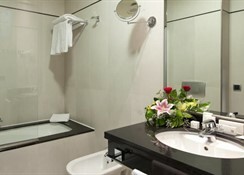 Hotel Valencia Center is a four-star property ideal for couples, solo travellers, business travellers and even families. Centrally located, it offers easy access to several touristic destinations — besides the comfortable rooms, it features restaurant, bar, cafeteria, pool fitness centre and more. 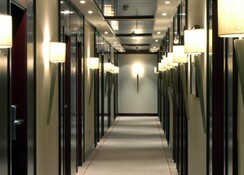 Hotel Valencia Center houses 140 modern guestrooms that come tailored with facilities, such as air conditioning, TV with satellite, private bathroom with shower, bath amenities, telephone, WiFi internet and large windows — choices of rooms are either two single beds or a double bed. Inspired by Mediterranean flavours, it houses a restaurant by the name La Magrana Restaurant — it serves authentic Mediterranean cuisine and selected international items. Its gastronomic affair extends to a cafeteria that serve snacks and in addition a cocktail bar. Recreational and relaxing facilities in the hotel include an outdoor swimming pool, a Jacuzzi, a solarium, and a fitness centre. 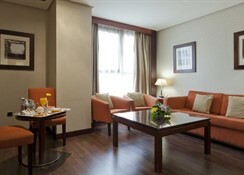 Located on the bank of Turia River, Hotel Valencia Center is a four-star property in the heart of Avenida de Francia. Surrounded by numerous museums, art galleries and other places of interest, the hotel is convenient for all kinds of travellers. The nearest golf course is 15 km away, and the nearest beach is about 1500 metres from the hotel premises. Also, you’ll find tons of restaurants, bars, shops and clubs within 100 metres from the hotel.